This weekend Gordon stays at his grandfather's house and since they both enjoy playing chess, they spend most of the time doing this interesting and useful activity. 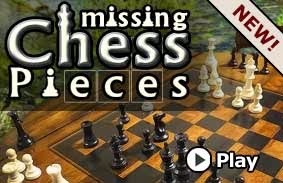 But it is always like that with those chess figures – they seem big enough for playing but in case that you lose one of them, it is always hard to find it. This time Gordon's grandfather has lost one so he has asked Gordon if he could help him find it.